A Few Scraps: Mesmerized - new PRINT pattern! 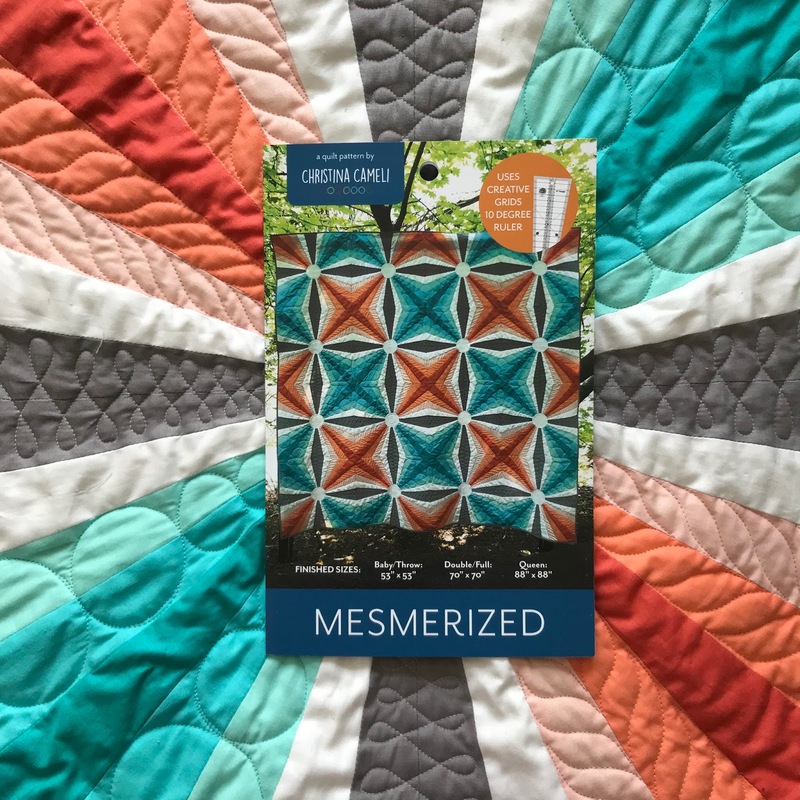 Mesmerized - new PRINT pattern! You know that saying "One thing leads to another"? My entire quilting life has been about that saying I think. Like that time I splurged and bought a wedge ruler. And I fell in love with it and made like 5 quilt tops with it and bought another wedge ruler. And I wanted everyone else to fall in love with wedges so I did a webinar. And then I wasn't done expounding about how truly fabulous wedges are, so I wrote a book. And then a Big Time quilting company with a new wedge ruler said would you like to make some patterns with our new ruler? And then boom, I had a printed pattern business. The most important thing for me about going into print patterns was... get this... plastic. I seriously couldn't stand to put more plastic waste into the world. So I decided my patterns are not going into plastic bags. (Don't make me regret this, quilters! Be nice to them if you see them in your LQS, they're naked!). I didn't know how to make this happen but my friendly pattern designer and I schemed up a way to make them hang nicely in the quilt shops without plastic bags. Our solution: holes at the top of the pattern! It means a little more work for her in the design stage, and I have to put a little sticker on the side of each pattern to keep them closed and not flopping open, but I like the solution. With the plastic problem solved, I'm quite contentedly moving into print patterns. 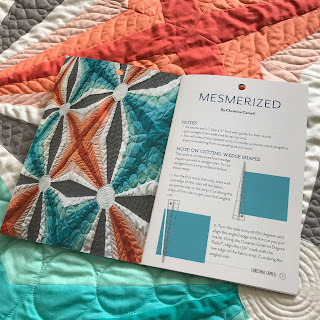 I've only produced two patterns in print so far, because printing is a real investment up front and oh yeah, quilts take time! But I'm working on more and they'll be ready if the first ones start selling. And I'll keep my patterns available digitally as well. Don't you love the little dots of sunlight coming through the quilting? It was such a beautiful day when I went to take pictures. And it's so fun hanging up a quilt to photograph at the park and getting to chat with people about it. Except mostly I spend my time waiting for the breeze to die down. This pattern is designed to be easy even if you're new to wedges, and it has directions for three sizes: baby, double and queen. It's for sale digitally with immediate download here. If you'd like to order it in print, your LQS can order it through Checker Distributors. You'll need the Creative Grids 10 Degree Ruler to make the quilt, so make sure get that too!! Any advice for me and my new pattern business? I'm all ears! Happy stitching everyone! Congratulations on the new adventure! I like the idea of no plastic bags a lot. Love this quilt and if I can add my penny, make your patterns available as PDF downloads. With the corruption in our country, I am petrified to order anything that needs to be posted. If the packaging is too attractive, it will mysteriously disappear. I love a PDF download and will go as far as saying "prepared to pay the same price as a printed version" but I know the PDF will get to me without being stolen by some corrupt postal worker. The quilt is beautiful, but the quilting is amazing. You have such a gift. Congrats!! The quilt is absolutely gorgeous. Congratulations on your new pattern business! Beautiful quilt and wonderful quilting! I'm glad you were able to keep packaging green! Also, I'm so very happy to congratulate you on your business success! Great patten! And wonderful news! Advice? Keep it fun!